CALGARY, AB – The newest location of Alberta liquor store chain Wine & Beyond is set to open later this week in Calgary’s Sage Hill neighbourhood, and will feature one of the largest and most unique growler bars in the province. Curated by Zach Wiskar – former sales rep for Ribstone Creek and longtime supporter of Alberta’s craft brewing scene – with help from Dani Killam and Rob Singleton, the bar’s 24 taps will feature beers from Alberta breweries that are almost entirely exclusive to the store, with many of them co-brewed by Wiskar. 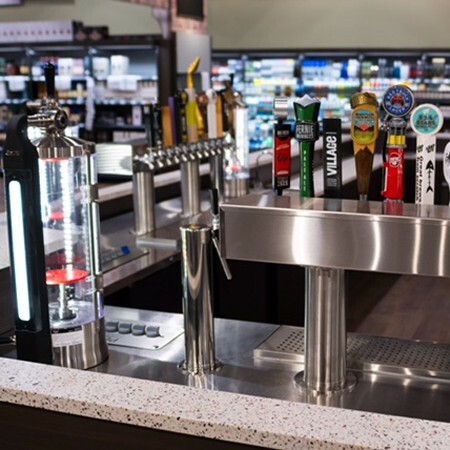 In addition to the exclusive brews, the bar includes such top-of-the-line features as “a short-draw CO2 fed system with 4 PeGas fillers and a crowler machine,” making it one of the highlight attractions at the 20,000+ square foot store. Wine & Beyond Sage Hill will be opening tomorrow (Thursday September 21st) at #120, 55 Sage Hill Plaza NW in Calgary. For more details, see the Wine & Beyond website and Facebook page.